The Horses on this page are available for adoption as riding horses. These horses are either currently in saddle training or have completed their saddle training. The Training Level Progress Report or Evaluation for each horse is posted in the listing. 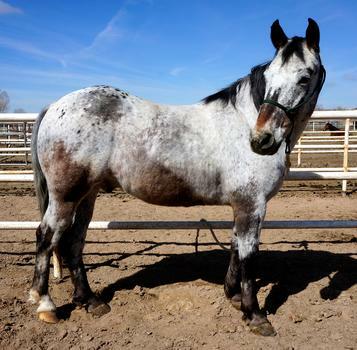 Possible adopters are encouraged to review the videos and the Progress Reports/Evaluations to help you decide if this horse is a match for you. Please note - we do not haggle over the adoption fees. The fees we set are fair and modest. We are not horse traders, we are a horse rescue. All funds derived from adoption fees go to help save another horse. Joker is a very nicely trained 16 year old gelding about 15 HH. 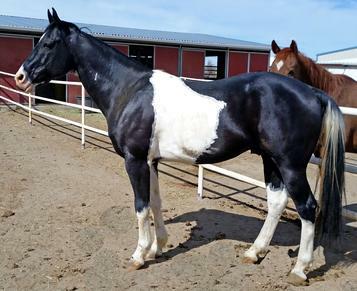 He is easy going onthe trail, does great in the round pen, stand for the farrier like a pro! Joker understands leg ques, ponies other horses without hesitation and is a pleasure to handle on the ground. He likes people and will readil engage as a willing partner. Joker is blind in his right eyes, although he has adjusted to it well and you'd not know it most of the time. He is not spooky on either side. The ideal home for Joker would be iwth a rider who knows leg ques and will use him as a trail horse. Joker is current on vaccinationsm, deworming, teeth floating,and farrier work. Cee Cee is a 12 year old Paint gelding. Cee Cee stands about 15 HH and weighs about 1000 lbs. The right partner for Cee Cee is an experienced rider who knows how to set boundaries. His adoption fee comes with 4 riding lessons with a professional trainer. He is current on vaccinations, deworming, teeth floating and farrier work. Queenie is a 12 year old mustang mare. She came to us untamed, but is now rideable. Queenie is an exceptionally willing and gentle mare. Compliant in the round pen, she absolutely loves trail riding and truly shines when out on the trail. She transitions from walk, trot and canter very well. Due to her short and slightly swayed back, Queenie will need an experienced light rider. She is up to date on vaccinations, deworming, teeth floating and farrier work. Corrales is an 8 year old BLM mustang gelding. He came to FCER as a law enforcement assisted owner surrender. Corrales stands appx. 14.3 HH. He is trained to ride, and is a good, solid riding horse. He gets along well with other horses when riding. Corrales loads nicely, stands tied, and responds to leg cues. The right home for Corrales would be with an experienced rider who like to trail ride. He is current on vaccinations, deworming, teether floating and farrier work.